Arsenal survived a Barcelona masterclass to stage a stirring recovery from two goals down and keep their Champions League hopes alive at the Emirates. Goalkeeper Manuel Almunia produced a string of stunning saves to keep the reigning European champions at bay as they passed the Gunners into submission in a magical first half-hour that had everything - except the goal Pep Guardiola's side deserved. The north Londoners, who lost Andrey Arshavin and William Gallas to injury before half-time, looked to be on their way out of Europe and potentially on the wrong end of a humiliating beating as Barcelona struck twice in the opening stages of the second half. It was the final act of drama on what Wenger correctly labelled "a great football night. An exceptional football night". And a night when Arsenal defied logic to keep themselves alive. 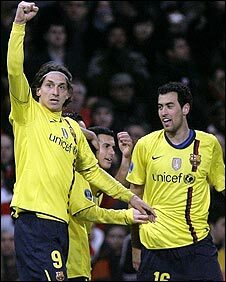 Zlatan Ibrahimovic took advantage of Almunia's charge from goal to score seconds after the break before then grabbing a crucial second away goal with a rising drive after collecting Xavi's pass on the hour - his first goals in 11 games against English opposition. Nicklas Bendtner saw Arsenal's best chance saved by Barcelona keeper Victor Valdes - but it was the introduction of substitute Theo Walcott that finally gave Arsene Wenger's team the impetus to claw their way back into a tie that looked way beyond them. He raced clear to fire under Valdes with 21 minutes left - and Cesc Fabregas turned logic on its head, given the evidence of the previous 85 minutes, by scoring from the spot after he was brought down by Barcelona captain Carles Puyol. Puyol was sent off and misses next week's second leg, as will Fabregas after he picked up a yellow card in the first half. Fabregas left Wenger with another worry as he limped painfully through the closing minutes after aggravating a leg injury scoring his penalty. Barcelona are in pole position to make their way through to the semi-finals, but they will curse taking their foot off the gas and offering Arsenal some hope when they travel to the Nou Camp for the second leg. Former Arsenal striker Thierry Henry was warmly welcomed when he made a brief appearance as a substitute, but his impact was minimal. Gunners boss Wenger risked Fabregas, who needed a fitness test in the warm-up, and brought back Gallas after an eight-game absence with a calf injury. Barcelona illuminated the opening exchanges with a virtuoso display of passing, pace and movement that left the home side devoid of any meaningful possession - and it was only the much-maligned Almunia, and Ibrahimovic's wastefulness in front of goal, that kept the teams on terms. Lionel Messi set the tone with a run that sliced Arsenal apart in the opening seconds. It resulted in a corner and it took a fine save low down from Almunia to deny Sergio Busquets. Almunia stood alone and exposed as a defiant one-man barrier in the face of a barrage of Barcelona attacks as Arsenal were comprehensively ripped to shreds by the quality of the holders' approach play. He blocked Messi and then Ibrahimovic spared Arsenal when he blazed over the top with the goal at his mercy after being set up by Dani Alves' inviting cross. Almunia also saved twice in quick succession to deny Ibrahimovic and Xavi while Alex Song cleared off the line from Alves as the Gunners simply had no answer to the Catalan giants. They finally ended the siege after 23 minutes when Samir Nasri broke into the area and curled a shot narrowly wide with Valdes struggling. The home side's attempts to establish any sort of foothold in the game were hampered by an early injury to Arshavin, who was replaced by Emmanuel Eboue. Gallas failed to last until half-time with a recurrence of his calf injury and another blow arrived just before half-time when Fabregas was harshly booked for tangling with Busquets. After somehow making it through to half-time without going behind, Wenger was left desperately frustrated to see his side concede within seconds of the restart - with the previously impeccable Almunia badly at fault. He made a rash charge from his goal as Ibrahimovic went in chase of Gerard Pique's long ball, leaving the striker with the easy option of lofting the ball over the onrushing Almunia to give the visitors the lead they thoroughly merited. Bendtner should have equalised for Arsenal after 53 minutes when he arrived on the end of Gael Clichy's cross, but his header from eight yards was brilliantly turned away by Valdes. Barcelona responded in style with a second goal just before the hour, Ibrahimovic taking advantage of flat-footed defending by Arsenal to collect Xavi's pass and lash a powerful finish high past Almunia at his near post. Arsenal's spirit in the face of such superiority from their opponents was admirable, and substitute Walcott offered them hope in the 69th minute when he scored low under Valdes, who should have done better. There was a further ray of hope for Arsenal soon after when Pique picked up a yellow card for a foul on Fabregas, leaving him suspended for the second leg on 6 April. With Puyol's later red card also ruling the Barca skipper out, Barcelona will be without both first-choice centre-backs at the Nou Camp. Messi had been relatively subdued after his early brilliance, but he broke the shackles to burst clear and force another excellent save from Almunia as the Spanish giants refused to take a backward step. 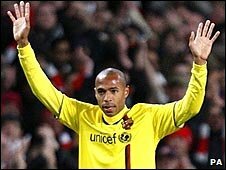 Goalscorer Ibrahimovic was then replaced by Henry, who was deservedly afforded a wonderful reception from the Arsenal fans who still idolise him. Suddenly, however, the momentum was with Wenger's men and, with five minutes left, they were level after Puyol bundled over Fabregas as he prepared to shoot in the area. Puyol was sent off and the Arsenal skipper completed the formalities from the spot. It was more than the Gunners deserved on the balance of the game, but means they travel to Spain next week still harbouring ambitions of a place in the semi-final. 90:00+3:03 The referee blows his whistle to end the game. 90:00+1:07 Theo Walcott produces a cross, Victor Valdes makes a save. 89:55 The ball is sent over by da Silva Dani Alves, Manuel Almunia makes a save. 88:31 A cross is delivered by Rodriguez Pedro. 87:39 Free kick awarded for a foul by Alex Song on Thierry Henry. Hernandez Xavi delivers the ball from the free kick right-footed from left wing, save made by Manuel Almunia. 85:42 Substitution Gabriel Milito replaces Leo Messi. 84:53 GOAL - Francesc Fabregas:Arsenal 2 - 2 Barcelona Power penalty scored by Francesc Fabregas. Arsenal 2-2 Barcelona. 83:29 Sent off Carles Puyol shown a red card. 83:18 Carles Puyol concedes a Penalty for a foul on Francesc Fabregas. 81:17 Theo Walcott challenges Scherer Andrade Maxwell unfairly and gives away a free kick. Scherer Andrade Maxwell takes the direct free kick. 80:03 Unfair challenge on Vassiriki Diaby by Sergio Busquets results in a free kick. Francesc Fabregas restarts play with the free kick. 79:32 Free kick awarded for an unfair challenge on Samir Nasri by da Silva Dani Alves. Free kick taken by Samir Nasri. 78:41 Gerard Pique takes the direct free kick. 78:41 Booking Vassiriki Diaby is given a yellow card. 78:34 Vassiriki Diaby concedes a free kick for a foul on Seydou Keita. 75:57 Gerard Pique restarts play with the free kick. 75:57 Substitution Thierry Henry comes on in place of Zlatan Ibrahimovic. 75:57 The referee gives a free kick against Nicklas Bendtner for handball. 75:30 Leo Messi takes a shot. Manuel Almunia makes a save. 73:50 Scherer Andrade Maxwell takes the free kick. 73:50 Booking Emmanuel Eboue is cautioned. 73:42 Unfair challenge on Carles Puyol by Emmanuel Eboue results in a free kick. 71:07 Francesc Fabregas produces a strike on goal direct from the free kick. 71:07 Booking Gerard Pique receives a yellow card. 71:01 Unfair challenge on Francesc Fabregas by Gerard Pique results in a free kick. 70:29 Centre by Theo Walcott, Gerard Pique manages to make a clearance. 68:55 Assist on the goal came from Nicklas Bendtner. 68:55 GOAL - Theo Walcott:Arsenal 1 - 2 Barcelona Goal scored by Theo Walcott from inside the penalty area to the bottom left corner of the goal. Arsenal 1-2 Barcelona. 68:19 The ball is crossed by Gael Clichy, save made by Victor Valdes. 67:45 Theo Walcott delivers the ball, comfortable save by Victor Valdes. Correction - 65:44 Substitution Theo Walcott on for Bacary Sagna. 65:44 Substitution (Arsenal) makes a substitution, with Theo Walcott coming on for Samir Nasri. 65:37 A cross is delivered by da Silva Dani Alves, blocked by Gael Clichy. 65:08 Free kick awarded for a foul by Leo Messi on Neves Denilson. Direct free kick taken by Neves Denilson. 63:21 Unfair challenge on Sergio Busquets by Neves Denilson results in a free kick. Free kick taken by Carles Puyol. 62:44 Rodriguez Pedro challenges Emmanuel Eboue unfairly and gives away a free kick. Francesc Fabregas takes the direct free kick. 61:38 The ball is delivered by Bacary Sagna, save made by Victor Valdes. 59:56 Neves Denilson fouled by Sergio Busquets, the ref awards a free kick. Neves Denilson takes the free kick. 58:34 Hernandez Xavi provided the assist for the goal. 58:34 GOAL - Zlatan Ibrahimovic:Arsenal 0 - 2 Barcelona Goal scored by Zlatan Ibrahimovic from inside the penalty area high into the middle of the goal. 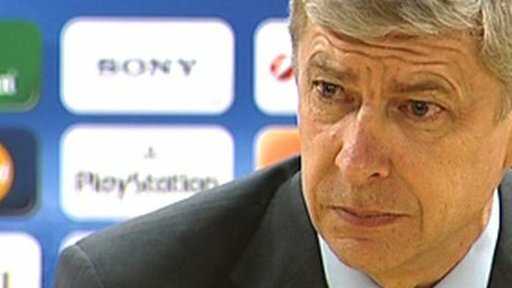 Arsenal 0-2 Barcelona. 57:52 Centre by Scherer Andrade Maxwell, clearance made by Thomas Vermaelen. 57:11 Bacary Sagna gives away a free kick for an unfair challenge on Seydou Keita. Free kick taken by Scherer Andrade Maxwell. 55:07 Centre by da Silva Dani Alves, Bacary Sagna makes a clearance. Correction - 51:32 Unfair challenge on Zlatan Ibrahimovic by Alex Song results in a free kick. Leo Messi fires a strike on goal direct from the free kick. Sergio Busquets takes a shot. Nicklas Bendtner takes a shot. Save by Victor Valdes. Bacary Sagna gets a block in. The ball is sent over by da Silva Dani Alves, Close range header by Hernandez Xavi goes wide of the left-hand post. 51:32 Free kick awarded for an unfair challenge on Zlatan Ibrahimovic by Alex Song. Leo Messi fires a strike on goal direct from the free kick. Sergio Busquets takes a shot. Nicklas Bendtner takes a shot. Save by Victor Valdes. Blocked by Bacary Sagna. Da Silva Dani Alves produces a cross, Hernandez Xavi has a headed effort at goal from close range which goes wide left of the target. 50:57 The ball is delivered by Scherer Andrade Maxwell. Rodriguez Pedro produces a right-footed shot from the edge of the box and misses to the right of the goal. 48:40 The ball is delivered by Rodriguez Pedro, clearance by Thomas Vermaelen. 46:32 Da Silva Dani Alves fouled by Samir Nasri, the ref awards a free kick. Gerard Pique takes the direct free kick. 45:25 Assist on the goal came from Gerard Pique. 45:25 GOAL - Zlatan Ibrahimovic:Arsenal 0 - 1 Barcelona Zlatan Ibrahimovic grabs a goal from inside the penalty box to the top left corner of the goal. Arsenal 0-1 Barcelona. 45:00+2:03 The players leave the pitch at half time. 45:00+1:41 Samir Nasri produces a cross, clearance made by Carles Puyol. 45:00+0:51 Gerard Pique concedes a free kick for a foul on Nicklas Bendtner. Free kick taken by Neves Denilson. 43:40 Direct strike on goal from the free kick comes in from Zlatan Ibrahimovic. 43:40 Substitution William Gallas leaves the field to be replaced by Neves Denilson. 43:40 Booking Francesc Fabregas receives a caution. 43:35 Francesc Fabregas gives away a free kick for an unfair challenge on Sergio Busquets. Correction - 43:16 Samir Nasri delivers the ball, clearance made by Carles Puyol. 43:16 The ball is sent over by Samir Nasri, Scherer Andrade Maxwell manages to make a clearance. 42:51 Rodriguez Pedro produces a cross, clearance by Thomas Vermaelen. 39:54 Hernandez Xavi takes the direct free kick. 39:54 Booking Booking for Alex Song for not retreating ten yards at a set play. 39:51 Free kick awarded for an unfair challenge on Leo Messi by Alex Song. 39:01 The assistant referee flags for offside against Zlatan Ibrahimovic. Bacary Sagna takes the indirect free kick. 38:13 Unfair challenge on Gael Clichy by da Silva Dani Alves results in a free kick. Francesc Fabregas crosses the ball in from the free kick, comfortable save by Victor Valdes. 36:45 Samir Nasri crosses the ball. The referee blows for offside. Indirect free kick taken by Victor Valdes. 35:39 Free kick awarded for an unfair challenge on Hernandez Xavi by Samir Nasri. Strike on goal comes in from Leo Messi from the free kick, save made by Manuel Almunia. 34:45 Nicklas Bendtner crosses the ball, Vassiriki Diaby has a headed effort at goal from deep inside the area missing to the left of the target. 33:12 Gael Clichy challenges da Silva Dani Alves unfairly and gives away a free kick. Sergio Busquets takes the direct free kick. 32:30 Zlatan Ibrahimovic produces a right-footed shot from just outside the penalty box that misses to the left of the goal. 28:47 Centre by da Silva Dani Alves. The referee blows for offside against Zlatan Ibrahimovic. Free kick taken by Manuel Almunia. 28:05 Leo Messi takes a shot. Vassiriki Diaby gets a block in. Hernandez Xavi takes a outswinging corner from the right by-line played to the near post, clearance by Nicklas Bendtner. 26:28 Substitution Andrey Arshavin leaves the field to be replaced by Emmanuel Eboue. 26:07 The ball is swung over by da Silva Dani Alves, Alex Song manages to make a clearance. 23:21 The referee blows for offside. Thomas Vermaelen takes the free kick. 22:43 Samir Nasri has an effort at goal from just inside the box that misses to the right of the target. 22:02 The ball is sent over by Bacary Sagna, da Silva Dani Alves manages to make a clearance. 21:53 Bacary Sagna sends in a cross, Carles Puyol manages to make a clearance. 20:15 Hernandez Xavi restarts play with the free kick. 20:15 Booking The referee cautions Andrey Arshavin for unsporting behaviour. 20:11 Free kick awarded for a foul by Andrey Arshavin on Sergio Busquets. 19:57 A cross is delivered by Andrey Arshavin, clearance by Carles Puyol. 18:58 The referee penalises Seydou Keita for handball. William Gallas restarts play with the free kick. 17:15 A cross is delivered by da Silva Dani Alves, Gerard Pique takes a shot. Manuel Almunia makes a comfortable save. 15:50 Free kick awarded for a foul by Thomas Vermaelen on Sergio Busquets. Hernandez Xavi crosses the ball in from the free kick. Rodriguez Pedro takes a shot. Bacary Sagna gets a block in. Short corner taken by Hernandez Xavi from the left by-line. 15:04 Foul by Seydou Keita on Alex Song, free kick awarded. Free kick taken by Francesc Fabregas. 13:59 Scherer Andrade Maxwell produces a cross, Hernandez Xavi takes a shot. Save by Manuel Almunia. Leo Messi takes a shot. Save by Manuel Almunia. 13:44 Zlatan Ibrahimovic takes a shot. Save made by Manuel Almunia. 12:51 Centre by da Silva Dani Alves. Effort on goal by Leo Messi from just outside the area goes harmlessly over the target. 12:08 Foul by Vassiriki Diaby on Sergio Busquets, free kick awarded. Sergio Busquets takes the free kick. 10:48 Free kick awarded for an unfair challenge on Seydou Keita by Alex Song. Hernandez Xavi takes the free kick. 8:31 Effort from the edge of the penalty box by Zlatan Ibrahimovic goes wide of the right-hand upright. 6:20 Unfair challenge on da Silva Dani Alves by Samir Nasri results in a free kick. Gerard Pique takes the direct free kick. 5:39 Shot by Zlatan Ibrahimovic from deep inside the six-yard box clear the bar. 5:11 Leo Messi takes a shot from 20 yards. Save by Manuel Almunia. 3:18 Da Silva Dani Alves delivers the ball. 0:43 Zlatan Ibrahimovic delivers the ball, Thomas Vermaelen manages to make a clearance. Outswinging corner taken right-footed by Hernandez Xavi from the right by-line, Sergio Busquets takes a shot. Francesc Fabregas makes a clearance. Outswinging corner taken from the left by-line by Leo Messi, Alex Song makes a clearance. 0:11 The ball is swung over by Vassiriki Diaby, clearance by Scherer Andrade Maxwell.